The above info came from Robin Sena, and was edited by yours truly (contact me). The image came from Smallsanta@aol.com. Kao-chin is a player killer in The World met in episode 19 by Subaru. Her resemblance to Subaru is apparent, the differences include an alternate color pallete for her clothing, eye and hair, and the marking on her forehead - a green reverse question mark. Her wings are also a noticeably tanner shade than Subaru's. 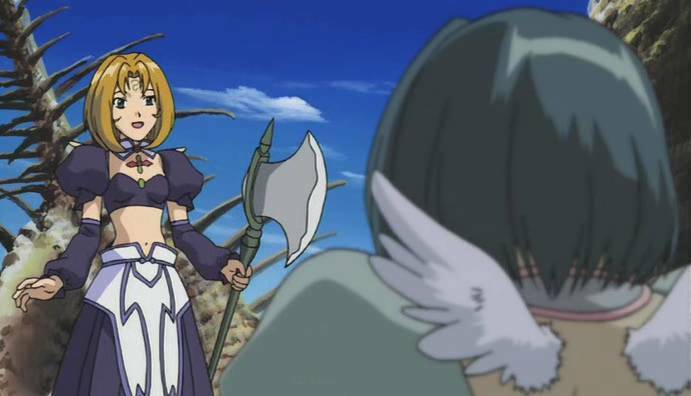 Kao-chin's role is not great as she appears in merely one episode, however, she symbolizes the changes going through The World at that point in the series. 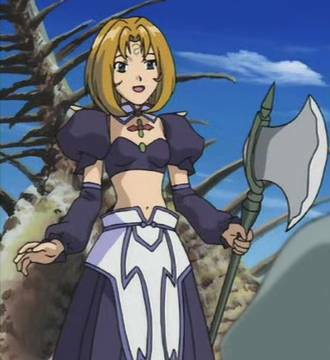 Her use of Subaru's player skin is due to the release and popularization of Subaru's own unique look. Kao-chin comments about this change, stating that she is not merely another Subaru clone. When Kao-chin realizes she's speaking to the real Subaru, she pesters her to become friends, but quickly grows hostile at the rejection she receives. When the drama between them intensifies with Kao-chin's threatening, she finally attacks Subaru. The above description came from Robin Sena, and was edited by yours truly (contact me).